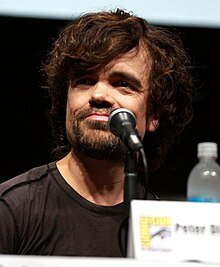 Peter Hayden Dinklage (born June 11, 1969) is an American actor and film producer. I like animals, all animals. I wouldn’t hurt a cat or a dog—or a chicken or a cow. And I wouldn’t ask someone else to hurt them for me. That’s why I’m a vegetarian. “'Game of Thrones' Star Peter Dinklage on Why He's Vegetarian,” ad for PETA (26 August 2011). This page was last edited on 5 August 2018, at 21:04.